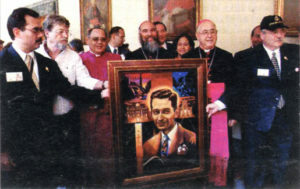 In 2001 I was deeply honored and humbled to be commissioned by the archbishop of San Juan, Monsignor Roberto González Nieves, to paint the official portrait of Blessed Carlos Manuel Rodríguez, to be given as a gift from Puerto Rico to the Pontifical North American College in Vatican City where it is exhibited in the Hall of Saints. 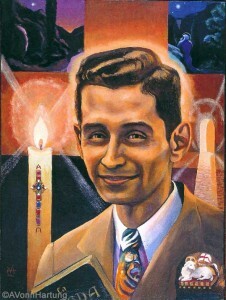 The Portrait is painted with various symbolic elements which express a visual prayer that “speaks to the eye” of what it was that helped bring Blessed Carlos Manuel to such an intimate connectedness to our Lord and Savior. The absolute serenity and joy in Charlie’s look is the faith that we seek, the faith that seeks us. 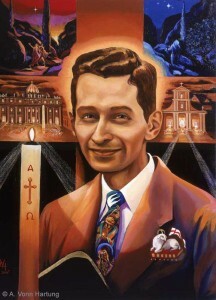 That was my second portrait of Blessed Carlos Manuel. 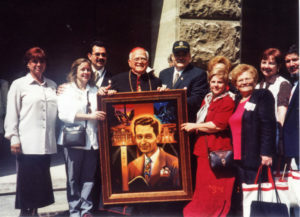 I had first learned about him from Padre Julio Victor García Padrón when in the year 2000 he commissioned me to paint Charlie’s portrait for San Francisco Javier Church in Trujillo Alto, Puerto Rico. This is the painting which later inspired the archbishop of San Juan to commission a portrait for the Vatican. 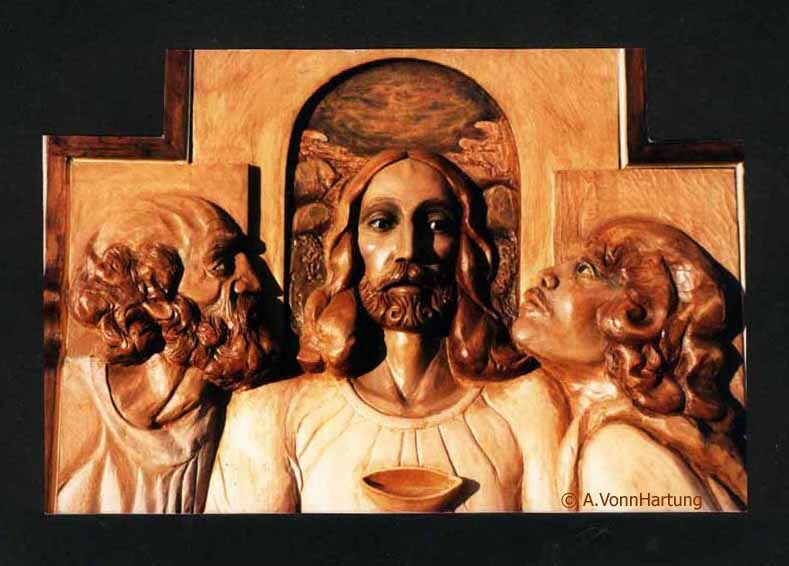 I painted these portraits within a harmony of interlacing symbolic elements which express an image of prayer, emerging from the darkness into the light of hope, drenching believers in the love of God. 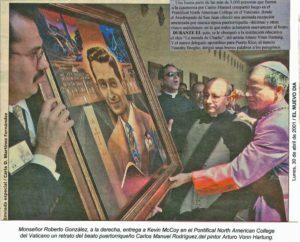 Prior to painting the portraits I had the great honor to meet with Carlos Manuel’s sisters, Hna Haydée and Titay, who told me that “Charlie” mostly wore a flamboyant necktie. In my paintings I transformed his necktie symbolically into the Wise Men from the Christmas narrative in Bethlehem, portraying them emanating from the Bible. The idea was that Carlos Manuel was also a wise seeker of wisdom and truth. The symbol on the knot of the necktie signifies the Truth given to him through the Holy Spirit which he spoke most eloquently. Posters of the two portraits are available here. This beautiful song was written by Norma T. Diaz Camacho, a disciple of Blessed Carlos Manuel, and director of the “Coro Peregrino” which sang this song during the Beatification Ceremony at the Vatican in 2001. Congratulations, you must feel very honored to have been chosen to do this portrait, and to do the interview.